Following are the notes from our weekly staff meeting at OneLife Church. Our view of a creative person is often packaged in flowing hair of various shades; tie dyed garments hanging loosely over sandals, moving in a slow motion trance, led by a starry eyed gaze and accompanied by tranquil eastern music, designed to give meaning to the subtle tattooed messages and countless piercings that litter the body. If you don’t fit this mould, don’t despair, creativity is powerfully expressed in engineering, teaching and relational skill sets as well as every other facet of life. That is because to be creative is the very essence of being human. God created you with an unfathomable potential to be creative, even if you dress yourself as your grandfather did. In the opening pages of the Bible God introduces Himself, not as Savior , not as redeemer, nor judge or even as King. He introduces Himself as creator. The creation narrative in Genesis 1:26-31 implies God’s creative genius was expressed in nature, science, law, relationships, problem solving, overcoming obstacles of evil, timing , bodily health etc. Mankind was made in God’s image and likeness with the same leaning toward creativity. Their God given mandate was to reproduce, enough to fill the whole earth ( creative in body). They were told to invent names for every animal (creative in words) . Their tasks included work, landscaping and food production ( creative in output). They were to run family affairs, solve problems , interact with science and nature etc. Creativity is at the very heart of being human. Sin resulted in mankind’s banishment from the epicenter of Gods creativity (deconstruction) . It resulted in thorny and dusty work environments (deconstruction) . Ultimately, for Adam’s children it resulted in murder ( final deconstruction). Today we still see the deconstruction of Gods plan , of family, of His law of health etc. Sin does not dull the creativity in mankind but it does distort it. Under the oversight of the sinful nature man creates in his own image and for his own glory. The Tower of Babel, Baals, shrines and temples were built for his own glory. They may be beautiful, but they are twisted and skewed inward. Our creativity is able to be centered once more. We are able to tap into the ideas of heaven. 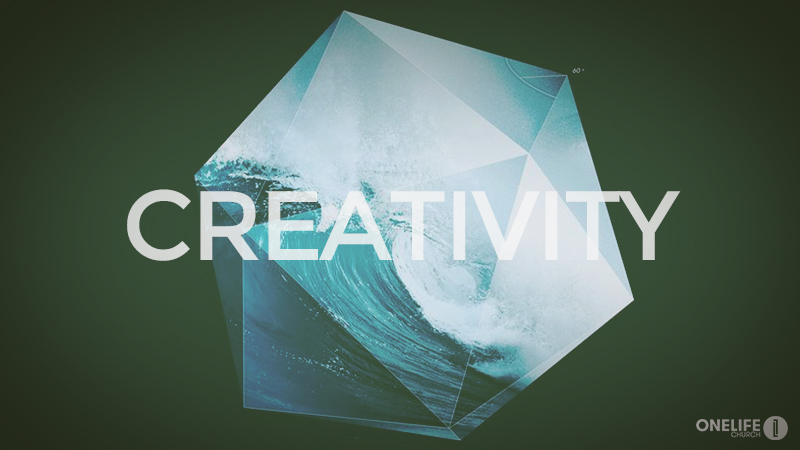 We can expect the creative force behind the universe to surge through us. The Bible uses language like : you becoming a “new creation”. He “breathes” life into you. The miracles we are expected to pray for are signs of supernatural creativity. We are reflectors of His light, we shine like creative beacons for a world to see and glorify God. As with the rest of mankind, Christians are made in the image (the creating/ creative image) of God. However, Christians also have ready access to the ideas of heaven. While I am certain that God gives ideas to secular people for the benefit of mankind, Christians can ask for these ideas. We can expect God’s intervention to burst upon us with explosions of heavenly thoughts, ideas and solutions. Christians can expect the downloading of Gods creative genius. Imagine what God can do in and through you, let your imagination go. In Eph 3:20 He promises that even your most extravagant imaginings are dwarfed by his magnificent plans for you. God is able to inspire a believer into creative action by giving them: a dream, a spontaneous “eureka” type moment or through a practiced process. Let me outline a few possible alternatives processes creative people use. In order to solve any problem the problem needs to be identified and defined. Very few creative solutions are arrived at by accident. Once that goal is clear , engineering back from the goal toward present reality is often a pathway to significant creative breakthrough . Alternatively, some try to clean the canvas, holding the end state in mind. Spontaneous thoughts are explored from random vantage points. This exercise involves running through their outcomes then scrubbing the sheet clean to try again till the most satisfying path is discovered. A Helicopter approach is sometimes used. Extracting oneself from the hum drum of the detail, mulling over variables over and over again until the breakthrough. To imagine with eyes of faith. To ask God, expecting Him to show you. That for every genius plan that flies, 50 not so genius plans were considered and left to die unnoticed. To be dogged and preserve till the creative spark ignites. Some people are stimulated by people, others by conversations, some by nature, others by silence. Find your sweet spot. Every creative application needs to go through the grid of practicality, of acceptance into the public domain. If you never apply the grid to your ideas they will lack traction and you will be confined to the realm of dreamers and “air heads”. However, if you apply the grid too early you will stifle the creative process and illuminate brilliant ideas before they take off. For that reason a good exercise in the “idea generation” phase is to say ( pretending money , people, leaders restraints were gone …..let me imagine) . Let these ideas fly , only bring out your reality grid much later to shoot down the really impractical and unworkable solutions.